Not everyone who wants to own a swimming pool can afford one, and some people who can afford a pool do not have space for it on their property. However, people facing these kinds of hurdles do not have to give up on their dream of pool-ownership. A plunge pool might be just the thing for your modest budget or limited space. A plunge pool is a small, typically shallow, pool designed for the purposes of wading or lounging. They are great for people who enjoy sitting on the steps of a pool and drinking a glass of tea in the summer, or for people who live in very hot climates and use their pools mostly to cool down. Because of their size, you cannot swim in a plunge pool, but you may be able to do other types of exercises, such as water aerobics. Plunge pools are popular in Europe and Australia, but they are just becoming established in the U.S. They tend to be most attractive to people who are interested in the aesthetic value of the pool and the lower cost to own and maintain one. Unlike a full-size pool, a plunge pool can be installed in a small yard and maintained on a smaller budget. Unlike an above-ground pool, a plunge pool can fit perfectly into a gorgeous landscaping and design background. The term ‘plunge pool’ typically designates a pool that was designed with leisure in mind. Similar pools include those that have jets that enable the users to swim against a current in a small space, sometimes referred to as lap pools, endless pools, or infinity pools. The dividing line between these kinds of pools can be blurry because some plunge pools do come with jets of some kind. How Big are Plunge Pools? The size of plunge pools can vary quite a bit. However, a typical size is around 8×8 feet to 8×16 feet. Because they come in all kinds of shapes, the absolute volume can vary quite a bit, from round pools that are 10 feet in diameter to half-circle pools with an 8-foot radius or square pools with 8-foot sides. 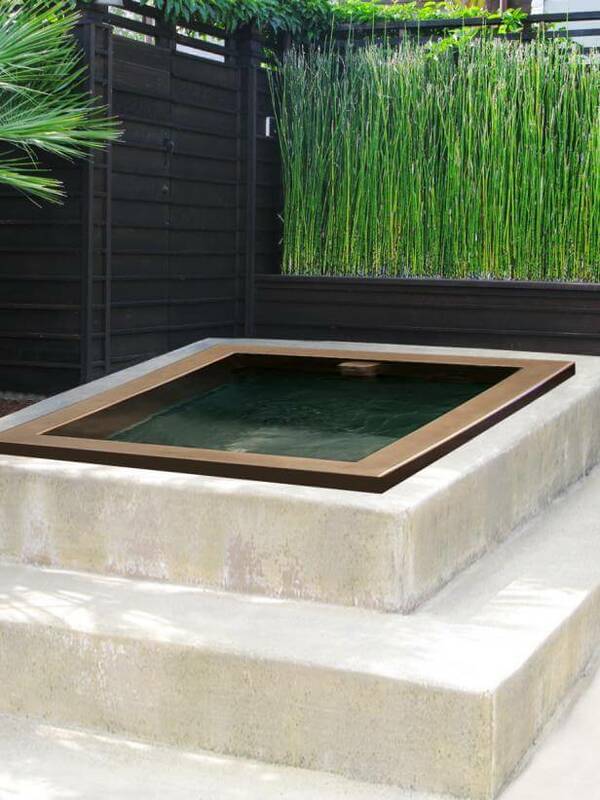 Given that they are small, most plunge pools are rectangular in order to create the most amount of usable space. However, just as with a standard sized pool, it is possible to get a plunge pool in any number of shapes. Half-circles, round, and L-shaped plunge pools are also popular. 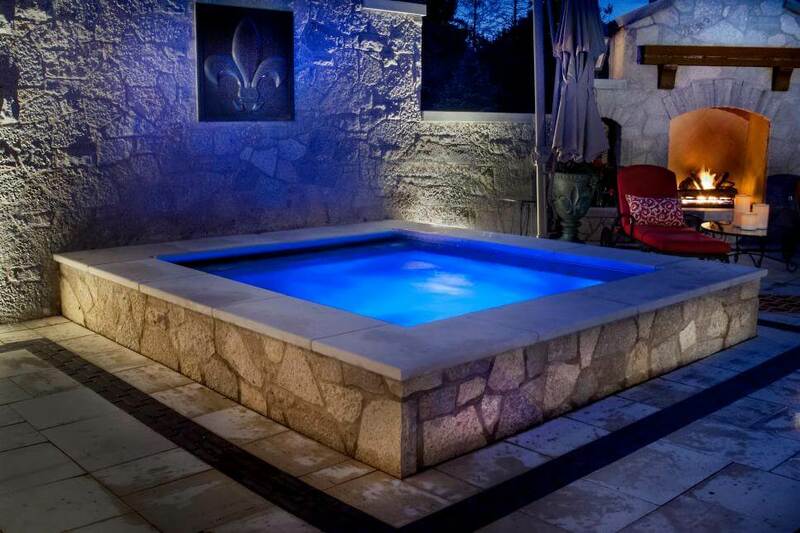 Custom-designed plunge pools come in almost any shape you can think of. How Deep are Plunge Pools? There is no rule stating how deep a plunge pool has to be in order to earn the name, but most are around 4 feet deep. People who want to perform water aerobics may want their pool to be a bit deeper, and people who want to sit on a shelf inside the pool may want it to be a bit more shallow. What Temperature is the Water in a Plunge Pool? Typically, plunge pools are cold bodies of water. However, some of them are designed to be used as a spa at certain times and a cold pool at other times. Cold also does not have to mean frigid, as there are plenty of heaters available for plunge pools. A heater can make the pool remain a comfortable temperature all year for people who use their pools to exercise or simply enjoy a quick dip even in the winter. Some athletes choose to maintain their plunge pools at very low temperatures (50-60 degrees Fahrenheit), while many people choose to maintain them at normal swimming pool temperatures (75-85 degrees). There is no particular ‘right’ temperature for a plunge pool, just your personal opinion. In warm areas, a heater may not be necessary, while in cooler areas, it may be absolutely essential. 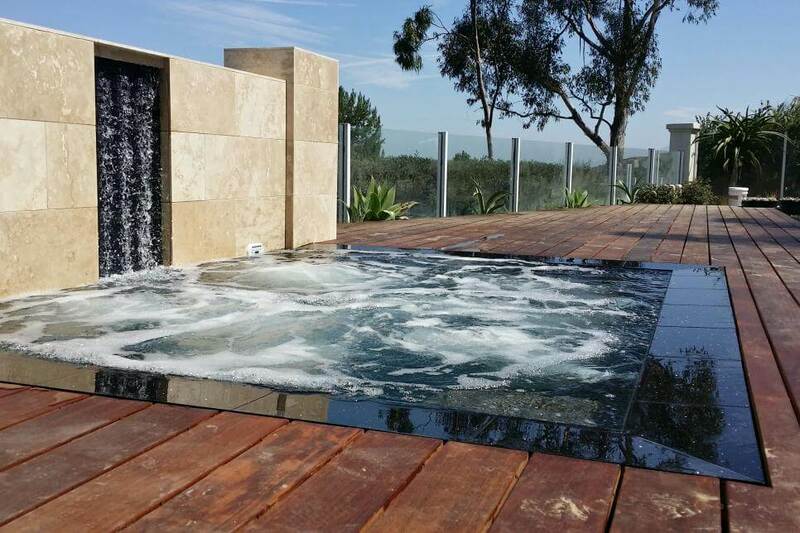 Plunge pools are usually built to fit with the aesthetic of your home and landscaping. They can be accessorized with features such as waterfalls or jets in order to create the desired image. Plunge pools can be heated just like larger swimming pools. A heater can be used to take the chill off a pool that would otherwise be unbearably cold, or it can be used to warm the water temperature to something that is comfortable to lounge around in. Unless the pool is designed to be a spa as well, however, it will generally remain a cool body of water. Some plunge pools have hot tubs attached to them to allow you to go back and forth from hot to cool water. This is a popular Asian practice that is used by athletes and supposedly improves mood. It is also possible to have jets installed in your plunge pool, either for the aesthetic value of a churning water surface or to act as massagers. Waterfalls are popular attachments to plunge pools. Some are merely decorative, while others can be played in by children or sat under by adults. Most plunge pools are too small for other play equipment such as waterslides or fountains, but a few of the larger designs can accommodate these. Sometimes referred to as a ‘spool’, there are plunge pools that do double-duty as spas. These pools can be maintained at normal swimming temperature some of the time and turned into hot tubs at other times. Many of these also feature strong jets for lap swimming, although not all of them do. 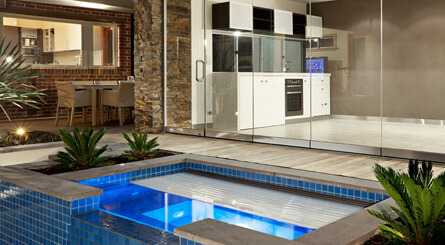 On the aesthetic side, plunge pools can offer a lot as a design feature. They can fit into modern designs as a sharp-edged, blue-water square, or they can fit into artfully overgrown yards as a rock-edged pond. Want to put a fountain in your yard? A plunge pool with a fountain inside it makes the water feature serve double duty. 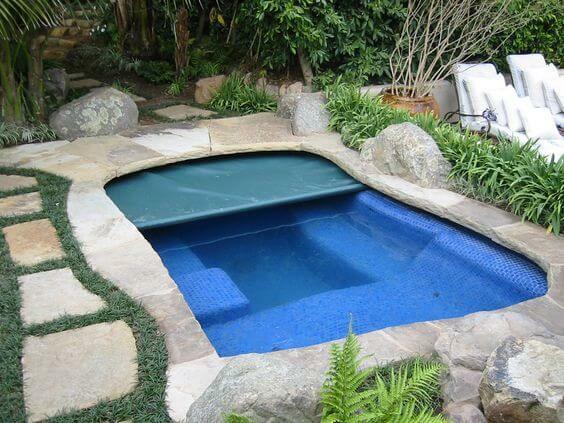 Just like covers for larger pools, covers for plunge pools come in a variety of types as well as appearances. Safety covers protect children and pets from accidentally falling into the water, and automatic covers offer a quick, push-button option for closing the pool when it is not needed. Covers for plunge pools serve much the same function as they do on larger pools: to keep out wildlife, dirt, debris, children, and pets. We can also make any cover lockable! The cost of a plunge pool varies widely depending on the size and style you choose, your location in the country, and your own personal desires and needs. The average is about half of the cost of a standard-sized pool. Of course, fancy features and architectural design can add significantly to that base price. Just like larger pools, plunge pools are typically constructed in one of three ways: vinyl liner, fiberglass shell, or concrete. Vinyl pools are usually the cheapest, while concrete tends to be the most expensive, but also the highest quality option. There are pros and cons to each type of material when it comes to installing a plunge pool. Concrete is the most customizable option, but fiberglass and vinyl pools come in a wide range of styles, as well. Can I DIY My Plunge Pool? Despite their size, plunge pools are pools. This means that all of the same structural and design requirements that are necessary to install a successful pool are needed to install a plunge pool. 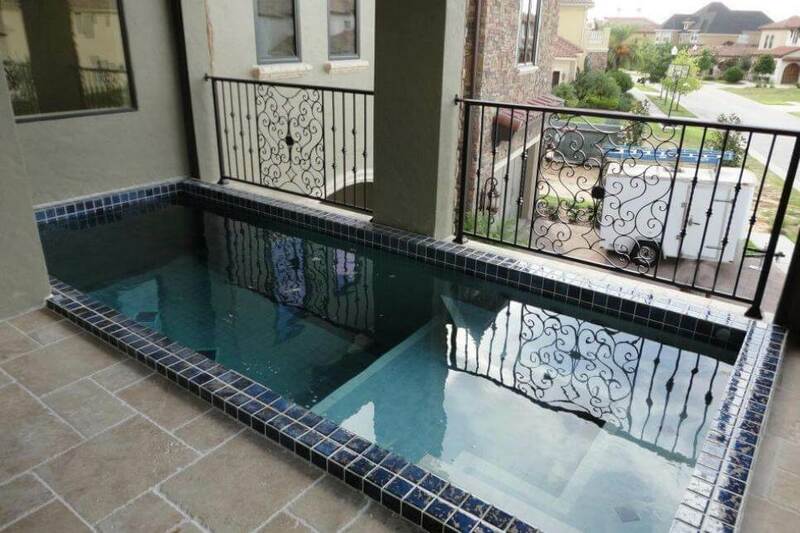 For most people, installing a plunge pool successfully is simply beyond their skills. Depending on where you live and how large the design of your plunge pool is, there may be building codes that apply and building permits that are required. You may also need the help of a design professional if you want to customize your pool’s shape, size, or features. Even if you choose a standard size and have no building codes to comply with, simply installing a pool properly requires a certain amount of skill and expertise. Getting started on a project and then having to hire someone to finish it, or worse, start all over again, can cost you tens of thousands of dollars more than it would to just hire a professional in the first place. For this reason and others, it is best to find a great builder and work with them to create your vision..and we can help! If you’re in the western North Carolina area, contact us about the BlueTerra Plunge Pool.